What is XMLmind Ebook Compiler? XMLmind Ebook Compiler (ebookc for short) is a free, open source tool which can turn a set of HTML pages into a self-contained ebook. This book could be a novel or a large, complex, reference manual. All in all, ebookc is an authoring and publishing tool nearly as powerful as DITA or DocBook and their advanced conversion toolkits, but being based on HTML and on CSS, it is much easier to learn, use and customize. Moreover you can create with it ebooks which are more interactive (audio, video, slide shows, multiple-choice questions, etc) than those created using DITA or DocBook. Reading article " HTML5 as an alternative to DITA and DocBook " should convince you to adopt ebookc. 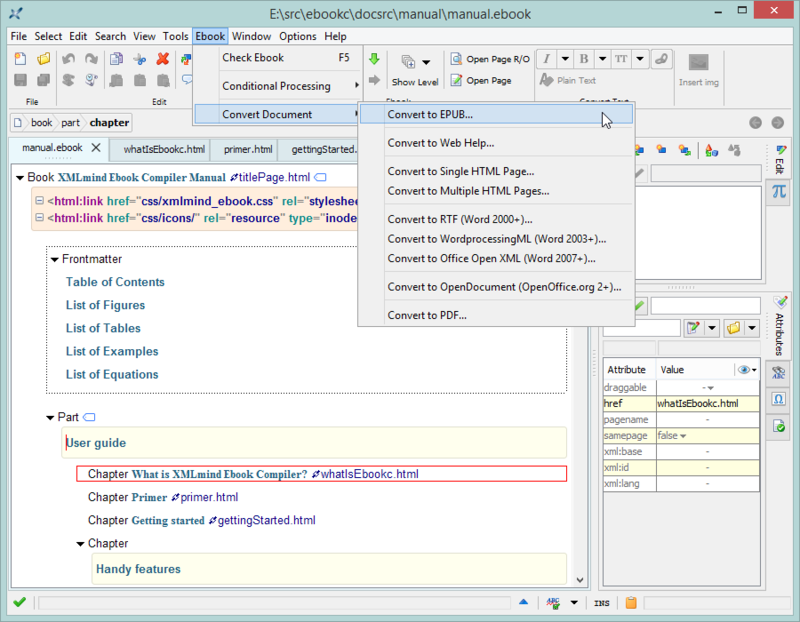 XMLmind XHTML Editor (or its superset, XMLmind XML Editor) has out of the box, extensive support for creating an ebook specification and its source HTML pages and for converting an ebook specification to a number of output formats. XMLmind XHTML Editor Personal Edition is free to use by many persons and organizations.